Tiger's Eye is one of five of the Big Cat Courses featured by Ocean Ridge Plantation. Designed by Tim Cate, this course is one of the most popular courses offered by Ocean Ridge. The 18 memorable holes of this course are flanked by a natural growth of wildflowers and grasses. It is no wonder this course is so highly ranked among all of the courses in the Myrtle Beach area. This Tim Cate design speaks volumes of the designer's ability to incorporate plenty of game challenges with the significance of the scenic backdrop. There are plenty of challenges on this course, both man-made and natural, to keep players pleasantly surprised and captivated throughout the entire round of play. However, this course is also pleasantly designed so that beginners can enjoy several hours of golfing as well. Whether players choose to play all five courses or just one, Tiger's Eye is one course that cannot be missed. Tiger's Eye requires an eye for accuracy due to several well-placed bunkers and water hazards that meander their way through the fairways. Sand bunkers and water hazards also serve as a guard among most of the holes on the course. Commonly referred to as one of the most beautiful and inspirational Cate designs on the Grand Strand, this course keeps players coming back for more season after season. The course is impeccably kept so that players always receive the best experience. It is best to go with a package deal so that players can dig their claws into all of the Big Cat Courses at Ocean Ridge Plantation. Very enjoyable course, highly recommended. Nice clubhouse and pro shop too. The golf was good. The property is in good shape. My only outstanding issue is my sun glasses; it appears I left them in the golf cart today. I left a call at the front desk of the clubhouse. I have been playing golf for over 25 years and this is one of the worst course conditions I ever played. 14 out of the 18 greens were dying and or being patched with sod, to make it even worse the staff was incredibly rude and pushy. I will never play this course again and make sure I steer as many people away as possible. Save your money and play one of the better courses in the area. This is the first time I have actually written a golf review in my life, hopefully it will be the last. Great day of golf with son and a couple from Georgia, Ray and Diane. Beautiful course but some greens we're pretty damaged from last winter. Still great day of golfing..
A really beautiful golf course. Absolutely gorgeous clubhouse. Greens were a little damaged over the winter but the fairways and bunkers are in great shape. Beautiful views of water falls, creeks, ponds and even the occasional gator. Keep your food on your cart in a safe place or the birds will find it and help them selves. Even the squirrels are friendly and seem to be looking for handouts. Excellent value! Will do again soon! 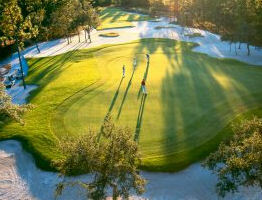 Tiger's Eye is one of five of the Big Cat Courses featured by Ocean Ridge Plantation.